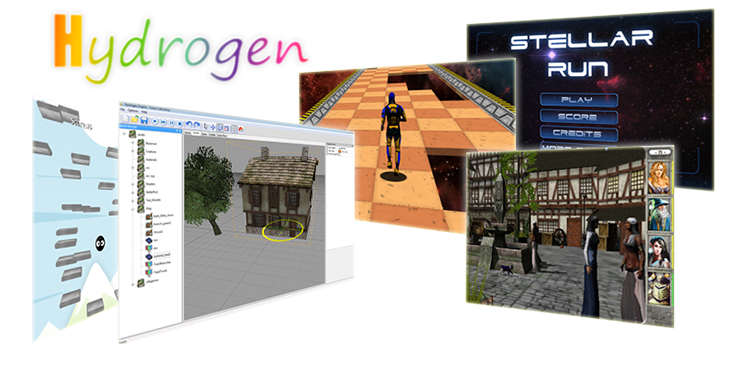 Hydrogames has developed a cross platform engine named Hydrogen. We are providing libraries to compile your games and applications, as well as tools to create any content with ease. It was designed with a modern approach with speed efficiency and low memory costs in mind, and also keeping the sdk easy to use. We currently support Android, iOS, Win32,Mac OSX, Marmalade/Airplay platforms allowing the process of developping games for these platforms straightforward. Basicaly, our applications and games are compiling on all platforms without any code change. The engine is including many facilities on all development topics (displaying formated text, handling full range of screen resolutions, sending highscores online, drawing 2D shapes, optimized rendering of 3D models and worlds, displaying webview, sending Http requests…). The assets pipeline is fully flexible : you can use you own picture or 3d model format smoothly within the engine. The Rendering system is fully scalable and flexible : use at the level of complexity you want, you can build your mesh and render them directly or use the high level world and entities management. The Rendering is powered by OpenGL, including in-house shader system working for both ES1.1 and ES2.0. The rendering pipeline has been extensively optimized to get the best of any GPU, including automatic render states managing, batch optimizations and many more. The world management is powerfull but easy to manipulate and remains easy to extends to fit your needs. Sound system is based on famous OpenAL featuring 3D sound source and background music playing, and on native media player for additional streaming. The hydrogen game engine is tightly integrated to the world editor to allow a wysiwyg environment (what you see is what you get) during your world creation process without any difference to the in-game final result. We provide a converter to import 3D assests from most of the popular 3D Tools through FBX file format. Our tool convert scene, meshes, animations, materials. You can use it with a gui interface or command line fashion. Batch conversion is also supported. Create your application or game project for one or all the platforms of your choice, all required files and libraries will be automatically created, and application sources will be shared accros any platform. Deploy tool currently support projects creation for Visual Studio, Android tools chain and XCode .